"My Family Is Not Illegal." It vividly occurred to me at the October 8th rally outside the U.S. Capitol Building that it’s time to discuss immigration legislation now and to grant undocumented immigrants a chance to earn their citizenship. As the government heads into its second week of the shutdown and disputes over health care and budget gambit have locked into a stalemate, some fear that immigration legislation may be put on the back burner. 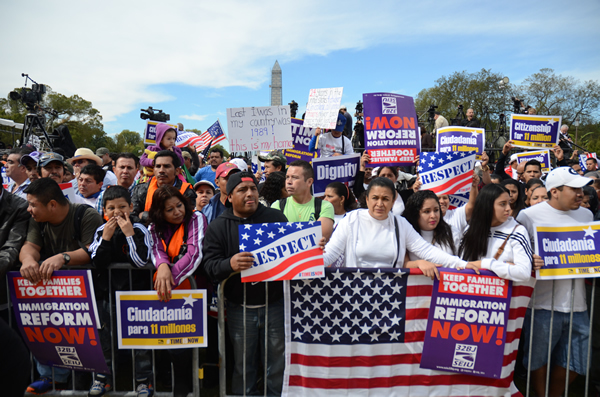 The rallies aimed to drive immigration legislation back into the spotlight. I was overwhelmed by the scale and morale of the rally and the march—a great throng packed out the main roads of the National Mall, overflowing onto the sidewalks, chanting in unison. House Minority Leader Nancy Pelosi and several other prominent members of Congress spoke to the crowd, and five-time Grammy-winning band Los Tigres del Norte gave a heartfelt performance. But what struck me the most was what the tens of thousands of immigrants in the rally, not to mention the 11.7 million undocumented immigrants they represent, have suffered. A few of them told their stories on stage and talked about how they desperately wished to see their father, mother, husband, or wife who had been labeled “illegal” and driven out of the country. “I want my daddy back; he is not illegal,” said a 4-year-old boy on the stage. What happened to his father was not uncommon. In fact, there are thousands of people just like him with no criminal background who have been ripped from their families, waiting for reunions that will never happen. While Congress continues to stall immigration reform, I believe that they don’t see, or pretend not to see the suffering that undocumented immigrants have incurred. It’s time to halt deportation and reunite those who have been senselessly deported with their families. It’s time to extend justice and equal rights to all Americans.